Two weeks worth of updates this time. 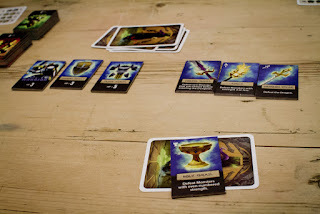 Last week I started off with some more Deception: Murder in Hong Kong before moving on to Welcome to the Dungeon, a little push your luck game that i did terribly at. As usual the night started off with Secret Hitler. Others were playing Betrayal at House on the Hill, Ca$h 'n Gun$, Dominion, Pit and Timelines. I ended the night with Container a game about producing, shipping and selling goods. At its core it's a bidding game. Goods are worth a different amounts to different people and you want to end up with the goods that are the most valuable to you. The twist is that the type of good you have the most of at the end of the game doesn't score anything. I got an early lead and somehow managed to keep it right up until the end. In the second week so many games made their IpBoG debut. 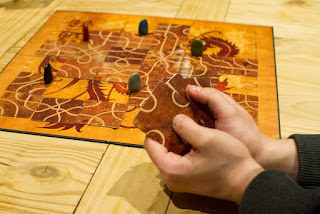 King's Forge, Tsuro and Las Vegas along with my new acquisition, Madame Ching. This was a bargain from the recent bunch of liquidated stock to be picked up by The Works. It's a pretty light little game when it comes down to it and there aren't that many choices to make. I didn't mind it thought and Dan seemed to enjoy it quite a bit. We both drew for first place with Dan beating me on the tie breaker. There were some IpBoG classics too. I played Chinatown and For Sale and I saw others playing Tragedy Looper and Citadels.